​Polonnaruwa is a UNESCO World Heritage Site in Sri Lanka’s North Central Province. Undoubtedly, Polonnaruwa and Anuradhapura are the island’s most significant ancient cities, Anuradhapura being the more ancient and Polonnaruwa the medieval one, mainly from the 12th century. You could argue, that Polonnaruwa is even more worth visiting than Anuradhapura, though indeed the latter is historically more important. But Polonnaruwa’s temples are in much a better state of preservation and Polonnaruwa has more numerous elaborated carvings and other decorations than Anuradhapura. Though the archaelogical zone of Polonnaruwa is not at all as vast as that of Anuradhapura, Polonaruwa is more densely crowded with remnants of Sri Lanka’s ancient civilization, that all in all there is as much to see as in Anuradhapura. Even outside the bounded archaeological park, there are further sites of interest, namely the remnants of the most ambitious giant tank of Sri Lanka’s Middle Ages, Topa Wewa, rarely visited ruins of Hindu temples, King Nissanka Malla’s palace with his magnificent lion throne, the “library monastery” inspired by Southeastasian architecture and an enigmatic rock sculpture of a sage. This carved statue most probably depicts the namegiving patron of the city, Rishi Pulasthi, though most tour guides will explain you that it shows King Parakramabahu the Great, who was the mightiest monarch of the ancient Sinhalese civilization. 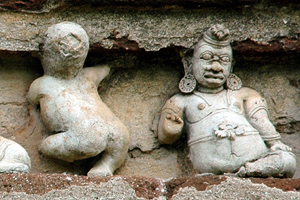 Two works of art in Polonnaruwa’s archaeological zone can be called landmarks not only of this World Heritage Site, but of the entire island nation. One of these two landmarks is definitely the best example of a kind of Buddhist architecture that is characteristic and unique to the ancient Sinhales civiliation, namely a circuit temple with a small dagaba in its centre, a so-called Vatadage. It is part of a group of temples on an elevated terrace called "quadrangle". It was once the ceremonial centre, where the Tooth Relic was kept, the island's national relic. Polonnaruwa’s other landmark is even more famous throughout the world. The rock-cut giant Buddha statues of Gal Vihara are not only impressive due to their sheer size but also due to their artistic and artisanal quality. Particularly the reclining Buddha is a masterpiece of Asia’s sculptural art. In order to see all attractions of Polonnaruwa, you definitely need a full day. 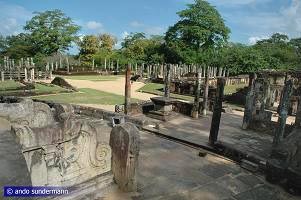 A normal guided tour only within the bounded archaeological area will take about 4 hours, visiting the highlights such as citadel with royal palace, quadrangle with circuit temple, Alahena Pirivena with Lankatilaka statue house, Gal Vihara with colossal Buddha statues, Tivanka statue and Nelum Pokuna Lotos Bath. Spending more than one day in Polonnaruwa also makes sense. A full day excursion can show you the beauty of Polonnaruwa’s “holy mountain” Dimbulagala at the other side of the Mahaweli river. During the summer months, Polonnaruwa is a perfect location for safaris in Minneriya or Wasgamuwa national parks to observe the world-famous “elephant gatherings”. Ancient Polonnaruwa is situated 230 kms away from Sri Lanka’s capital Colombo, in the north-eastern plains belonging to the island’s dry zone, and just at the eastern corner point of Sri Lanka’s historical area, which is well-known as “cultural triangle”. 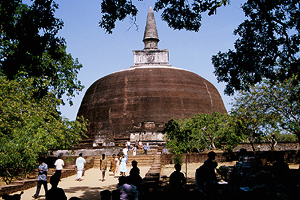 Polonnaruwa played an important role already in the Anuradhapura period. Polonnaruwa is believed to be the “Vijitagama”, later on “Vijitapura”, which is mentioned as one of the earliest Sinhalese settlements after their arrival on the island in the 6th century B.C.E. Indeed, archaeological evidence indicates human settlements existed in this area as early as in the 6th entury B.C.E., but maybe they are even pre-Sinhalese. Evidently, the Gopala Pabbata cave in the very centre of the archaeological zone was a Buddhist hermitage already in the 2nd century B.C.E., because its drip ledge carries inscriptions in Brahmi letters from that very early Buddhist period. In the middle of the first millennium C.E. - a period still belonging to the heydays of the Anuradhapura kingdom -, Polonnaruwa was simply known as “Kandavura”, meaning “armee camp”. The reason for a military base here was the strategic significance of Polonnaruwa’s location close to the most important ford crossing the island’s largest river, Mahaweli. This river marked the boundary of the “Royal Land” called Rajarata. 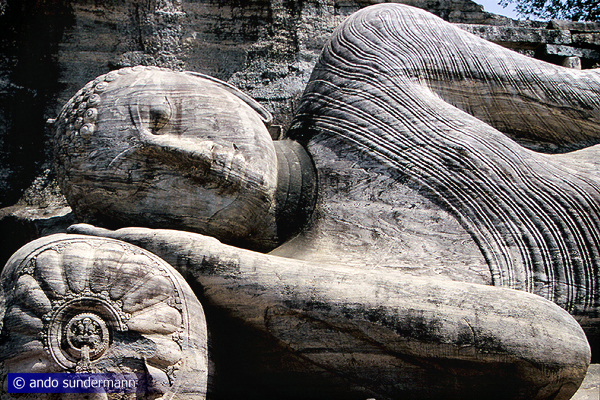 The sixth century saw the rise of powerful Tamil empires in Southern India and the decline of Anuradhapura’s strength. From the 6th century onwards, the army camp was frequently used as a refuge by Anuradhapura kings, just in periods when their capital was raided by Indian invaders in search for treasures in Anuradhapura’s Buddhist monasteries and royal palaces. The chronicles mention “Pulatthinagara”, which is the Pali name of Polonnaruwa, for the first time in their report about the reign of Aggabodhi III in the 7th century. Some Anuradhapura kings, namely Aggabodhi IV in the late 7th and Aggabodhi VII in the late 8th century, resided not only in Anuradhapura but in Polonnaruwa, too. In the 9th century - which is still the late Anuradhapura time - Sena I (833-53) was crowned in Polonnaruwa and became the first king who preferred to reside in Polonnaruwa instead of Anuradhapura. Udaya I in the begin og the 10th century was the last Sinhalese who mainly resided in the official capital, Anuradhapura. So the fortunes shifted slightly into the direction of Polonnaruwa anyway, when at the end of the first millennium the Anuradhapura Kingdom was finally conquered by the Chola invaders from Southern India. Ironically, it was the Chola rule, that decided to make Polonnaruwa the official capital of this island, which then was a province of their empire. The Chola governeurs ruled from Polonnaruwa. And this is the reason why there are so many traces of Hindu temples in Polonnaruwa, because Tamils settled in this area. And they remained to be an important factor even after the Chola occupation was terminated by the Sinhalese Prince Kitthi from the southern part of the island known as Rohana (Ruhuna). Kitthi’s final victory was the liberation of Polonnaruwa from Indian rule. When Kitthi ascended the thrown in the official Sinhalese capital, Anuradhapura, he got the royal name Vijayabahu “victory’s arm”. But only three months after his coronation he left Anuradhapura and resided in Polonnaruwa, like the Chola governeurs had done previously. Vijayabahu is counted the first king of the Polonnaruwa period. After his death, the Polonnaruwa kingdom fell into decay due to civil war within the Sinhalese nobility. It was in the middle of the 12th century, when finally the local ruler from the western part of the island gained control in Polonnaruwa and chose it as his final residence. This king is named Parakramabahu. Parakramabahu of Polonnaruwa became the most powerful king the island has ever seen. His reign is considered the Golden Age of Polonnaruwa. Never before and never after has the administration of the Sinhalese civilization been so centralized as under Parakramabahu’s rule. The significance of this king is even felt in Southeast Asia. His military expeditions turned out to be complete failures outside Sri Lanka. The chronicles keep silence about these disasters. But what is much important than his military achievements or failures, is the cultural charisma Sri Lanka gained under his rule. It was Parakramabahu who for the first time since 1000 years unified the Buddhist order. It fell apart again soon afterwards. But one legacy of Parakramabahu’s monastic reforms lasts - in more than one Asian nation - till the present day: It was under Parakramabhu that Theravada Buddhism became the only accepted school of thought in Sri Lanka and Southeast Asia. 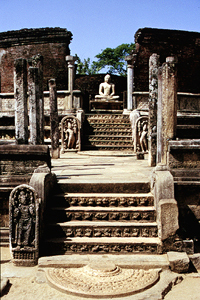 It was the Polonnaruwa period that saw the completely peaceful spread of this Sinhalese Buddhist tradition to Thailand and Cambodia, where it is called Mahavihara tradition, Mahavihara being the monastery which had been the Theravada stronghold during the Anuradhapura period and which was solely accepted for the unified order in the Polonnaruwa period. 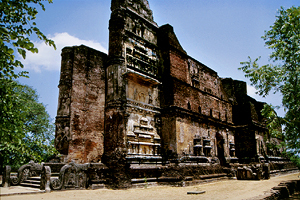 Most of the Polonnaruwa buildings, remnants of which can be seen today, are from the reign of Parakramabahu. One of his successors, Nissanka Malla, turned out to be the last Sinhalese king who could rule in peace and control the entire island. He also left many works of architecture and art in Polonnaruwa and more comprehensive inscriptions than any other Sri Lankan monarch. By the way: It’s not entirely clear, of Polonnaruwa was the capital during the Polonnaruwa period. 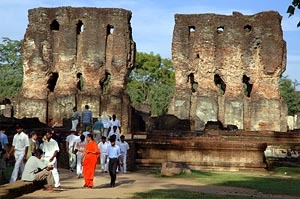 Anuradhapura, though starting to fall into decay physically, remained to be a kind of “official capital” of the Polonnaruwa kings, who nevertheless resided in Polonnaruwa exclusively and kept the Sacred Tooth relic, which was formerly sheltered in Anuradhapura, in Polonnaruwa’s temple quadrangle. There is a traditon to call the town with the Tooth Relic the capital of Sri Lanka. In this sense, Polonnaruwa was the capital indeed. (But in this sense, today’s capital would be Kandy). Ironically, when the Tooth Relic was shifted to Dambadeniya and other towns in the south-west in the 13th till 16th century, many of the kings of those period tried to be crowned in Polonnoruwa - similar to Polonnaruwa kings, who had been crowned in Anuradhapura. The town of coronation was called “mula rajadhani”, “root of kingship". So, literally Anuradhapura was the root of kingship for Polonnaruwa kings and Polonnaruwa became the root of Sinhalese kingship only after the kings did not reside here any more. The citadel is the southern part of Polonnaruwa’s archaeological zone. Polonnaruwa’s citadel is surrounded by a brick wall, which is in a good state of preservation. The majestic Royal Palace of King Parakramabahu the Great is a magnificent structure right in the centre of the citadel. This structure is also known as Vijayanta Prasada. It is said to have had 1000 chambers in seven storeys, of which the four upper floors were made of wood. The 3 metres thick brick walls, which once carried the entire tower building, are still up to nine metres high. Holes in the wall presumably held massive wooden beams, that carried the floor of the upper levels. Inside the building you can see parts of melted brick walls. The fire was probably set by looting soldiers of the incader Kalinga Magha in the middle of the 13th. The royal audience hall is a second impressive building in the area of the citadel. One interesting feature of Polonnaruwa, in contrast to Anuradhapura, is the presence of many Hindu temples among otherwise Buddhist ruins. This indicates a harmony between the two principal religious and ethnic groups during the Polonnaruwa period, namely Sinhalese Buddhists and Tamil Hindus. Because stylistically this Shiva shrine, which is the first structure you will see after passing the entrance gate of Polonnaruwa’s archaeological zone, is more closely relates to the Tamil Pandya architecture of South India than to the Tamil Chola style, it is likely that this temple was built in the late Polonnaruwa period, presumably not before the early 13th century. The temple, which was named Shiva Devale No.1 by early archaeologists, includes a walled-in courtyard in front of the main shrine, which is called Garbhagriha in Hindu architecture. This is the place, where the idol or an iniconic symbol - like a Lingam in this case - is sheltered. 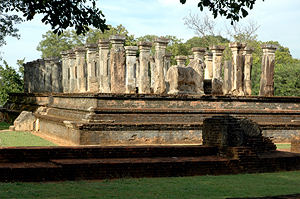 The main temple complex of Polonnaruwa is called Quadrangle, due to the almost square outline of the elevated terrace, on which many temples are placed. This was the area, where the Sacred Tooth Relic was kept and worshipped. Remarkably, the guardians of this holiest Buddhist relic where Tamil Hindu mercenaries. Different kings erected different monuments for keeping the Tooth Relic. The buildings supposed to be shrines of the Tooth relic are at least three, namely Hatadage, Atadage, and Vatadage, the latter being Polonnaruwa's iconic circuit temple already mentioned above. 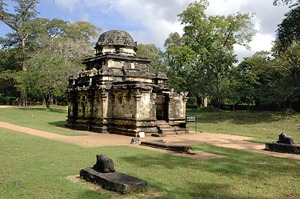 There are further interesting structures on the Quadrangle, for example coiled pillars, Sri Lanka's largest inscription stone, a tower inspired by Southeastasian architecture, and last not least Thuparama, one of the three large image houses, which have been characteristical architectural features of Sri Lanka's Buddhist architecture since the Polonnaruwa period. 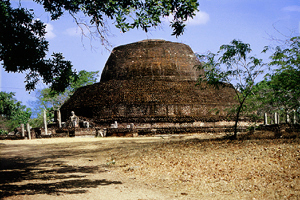 Pabalu Vehera, Polonnaruwa's third largest dagaba (stupa) is situated slightly east from the Polonnaruwa main track. You can find it at the cul-de-sac also leading to Shiva Devale No.2. The construction of this temple is attributed to a female, which is rare in Sri Lankan monastic architecture. Queen Rupavati, one of the wifes of King Parakramabahu the Great, is believed to be the donor. She was of lower caste origin and had worked as a dancer. The brick dagaba of Pabalu Vehera is of an unusual shape. It looks like a two-storey stupa. A smaller stupa is placed atop a larger one, the latter being not a dome, but only the basis of a dome. This double-structure can was used for other huger stupas during the Polonnaruwa period, too, but they are in other parts of the island. The largest dagaba ever built, Polonnaruwa's "Tamil Dagaba", was of the same size, but in contrast to Pabalu Vehera, it's not recognizable any more, because completely overgrown. Shiva Devale No.2 is the oldest structure in Polonnaruwa. It dates from the period of Chola occupation in the early 11th century, when the Indian invaders chose Polonnaruwa as their administrational headquarter on the island. Unlike most other buildings in Sri Lanka’s ancient civilisation, which were mainly built of brick and perishable materials, Shiva Devale No.2 is entire made of stone, this is the reason why the 1000 years old structure is perfectly well preserved. Shiva Devale No.2 has the typical form of a Chola temple, though on a smaller scale compared to the best examples of Chola architecture in Southern India. The inner sanctum, called Garbhagriha in Indian temple architecture, contains a lingam. This reveals it must have been a Shiva sanctuary. The term “Devale” is derived from “Deva-alaya”, meaning “god’s abode”. In Sri Lanka, “Devale” usually is a name of a shrine for a god who is also venerated by Sinhalese Buddhists. Rankot Vehera, also transcribed Rankoth Vihara, is a stupa built by King Nissanka Malla in the late 12th century. An ancient stone inscription situated close to this stupa identifies it by the name "Ruwanweli", which is also the name of the most venerated stupa in Anuradhapura. 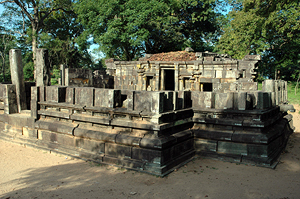 Obviously, Rankot Vehera served as its counterpart in Polonnaruwa. “Rankot Vehera” is a later Sinhala name meaning “Golden-pinnacle monastery”. Rankot Vehera does not reach the size and height of Anuradhapura’s giant stupas. However, with a diameter of 170 m and a height of 33 m it is still impressive and larger than all still existing ancient stupa domes in India. Typical for Sri Lankan stupas are four large frontispieces in the cardinal directions, they are called Vahalkadas. The structure is used statically to support the weight of a stupa. Stone slabs erected for the purpose of offering flowers at the stupa are added to these Vahalkadas. The main monastic complex of Polonnaruwa is now called Alahena Pirivena. Most buildings of this large complex were contructed during the reign of Parakramabahu the Great. The three most sacred buildings of Alahena Pirivena were built on top of a series of levelled natural hillocks. These three major buildings are the stupa called Kiri Vehera and the image house callled Lankatilala and the chapter house called Baddhasima Pasada. The latter is erected on the highest platform. This is where the highest celebrations and meetings of the monks where held. The central place was for the Sangharaja, the “king of the order”, an institution that helped unifying all previously separated orders. In a sense, this is the place where Theravada Buddhism finally became the exclusive form of Buddhism in Sri Lanka. However, the most impressive building of Alahena Pirivena is the Lankatilaka Pilimage, where a Buddha statue, though without head, is still in situ. “Nelum Pokuna” means “lotus pond” or “lotus bath”. Nelum Pokuna is only a small structure, located close to the Tivanka Pilimage in the north of Polonnaruwa's archaeological zone. But this stone bath is remarkable for its unique design. It has the shape of a lotus flower, with a diameter of almost 8 metres. The beauty of the artistic conception is the repetitionof this shape, the steps of this Ghat-stairway are five concentric lamina of eight petals grafually diminishing. 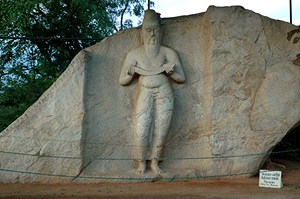 The Chulavamsa part of the Mahavamsa chronicle mentions a lotus bath among the many ponds attributed to King Parkramabahu I. “Nelum Pokuna” is also the name of the new main theatre building in Colombo city, which was sponsored and designed by Chinese partners. The shape of that new theatre follows the pattern of an eight-petal lotus flower, too. The achitects explicitely referred to the Nelum Pokuna of Polonnaruwa as an inspiration for their modern design. Tivanka, also spelt Thivanka, is a translation of Sanskrit "tribhanga", a term used for the typical posture of sculptures of Hindu gods, which is very uncommon for Buddha statues. The Tivanka Buddha statue measured about 8 metres originally. But regrettably, the head of the statue is not preserved. There are two more works of art of particular interest at the Tivanka statue house, one of them is a frieze of dwarfs at the outer walls. These dwarfs called Ganas are displayed in very lively and even funny postures. Ganas have been a popular theme in Sri Lanka's art ever since. But the Gana sculptures of the Tivanka statue house remain unsurpassed. Inside the shrine is another unique work of art, namely the best example of paintings from the Polonnaruwa period. All walls are covered with murals. Some of them depict dark demons. The Sinhalese name of "statue house" is Pilimage, by the way. So this extraordinary shrine is also known as Tivanka Pilimage. The former colonial rest house of Polonnaruwa is situated on the dam of the Topa Wewa. It’s an ancient tank of an impressive size even today. But be aware: What you see here close to Polonnaruwa’s archaeological zone, is only the smaller part of it, only the cove which is called Bendiwewa. The larger part of the Topa Wewa begins further south beyond a bottleneck at the Pothgul Vihara excavation. And that’s still not the full story. The medieval Parakrama Samudra (Parakramabahu's Sea) was estimatedly four times larger. 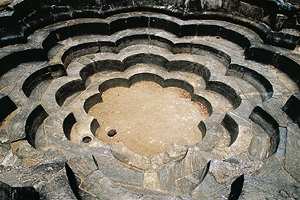 It integrated the Topa Wewa from the Anuradhapura period but enlarged it. 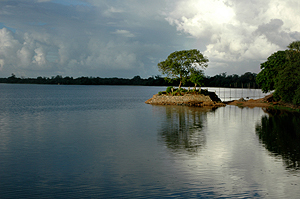 Indeed, Parakrama Samudra was by far the largest reservoir ever built by the ancient Sinhalese hydraulic civilization. It's highly recommendable to have a boat trip in the morning or evening at the southern part of the Topa Wewa, particularly during the local dry season, when elelphants of Wasgamuwa and Angammedilla national park gather at the lake. ​Remnants of Nissanka Malla’s palace complex called "island garden" can be foound behind the colonial Polonnaruwa Rest House, at the shores of Polonnaruwa’s tank called Topa Wewa. Historians believe that the palace building, which is now a very flat ruin, had once been a two-storied structure, with a wooden top floor. The most interesting structure of this royal complex is the Throne Hall of King Nissanka Malla. This council chamber is built on a rectangular terrace, with the main entrance at the northern side. The most striking feature is a huge lion sculpture at the southern end, where the throne must have stood. The sculpture is therefore often called the “lion throne”. This “council chamber” has four rows of pillars, twelve elaborated pillars in each row. The pillars carry short inscriptions, which are interesting, because they indicate the titles and positions of members of the royal council, which was headed by the king on his lion throne. 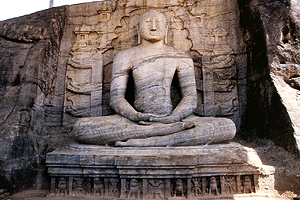 Situated in the southern outskirts, near the Pothgul Vihara, is a famous rock-cut sculpture of excellent quality. The correct interpretation of this statue still under discussion. Most Sinhalese people consider ot to be a portrait of Polonnaruwa's historically most important monarch, King Parakramabahu the Great. But the sacred thread running from the left shoulder across the body and the Ola palm leaf book carried in the hands are characteristics of Brahmin scholars. Some believe this statue to be a depiction of Rishi Kapila or Rishi Agastya. But most probably it's Rishi Pulastya, called Pulatthi in Pali or Pulasthi by locals. He is the name-giving patron of this city Polonnaruwa which in the Chulavamsa part of the Mahavamsa chronicle was called Pulatthinagara, meaning “Pulastya’s settlement”. Pulastya was the grandfather of the legendary king Ravana, who once was the mighty King of Lanka according the Indian Ramayana epic.